First Year Seminarians receiving the cassock. Our seminarians are very dedicated and generous young men. On the path to fulfilling their call to the Holy Priesthood, they are called to holiness and service to souls in a world that is in urgent need of returning to Our Lord. However, they do not always have the financial means necessary for the seven to nine years that it takes to complete the seminary program and be ordained a priest. The expense of maintaining the seminary building, as well as that of lodging, feeding, providing instruction, and supplying the necessary study materials to approximately sixty young men, is very high. Our seminarians are thus asked to contribute the relatively small amount of 1050€ per month toward these costs, but many are not able to afford this contribution. 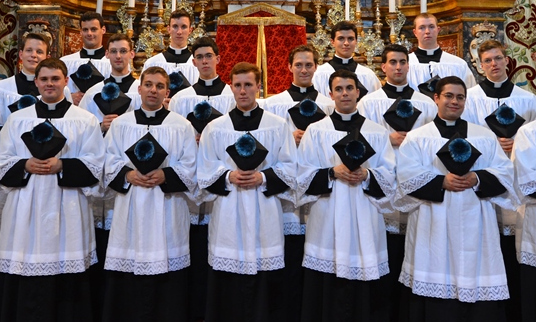 Would you be willing to adopt a seminarian and help support him throughout his seminary years? While occasional donations to our seminary are gratefully accepted, we would be deeply thankful if you could commit a monthly amount to cover fully or at least partially the expenses of one of our American seminarians. To adopt a seminarian, please donate online by marking your donation for “Le séminaire et la formation des séminaristes”.